Well let's see, now. We started out with a winter Olympics with no snow. Events on Cypress mountain were seriously in doubt as they trucked in snow from elsewhere. Too bad Philadelphia or Washington, D.C. didn't win the Olympics. At Whistler, fog and rain was such a problem that men's downhill skiing was postponed for two days. 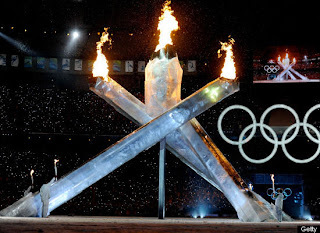 In the opening ceremonies, the hydraulics for one of the four indoor cauldrons didn't work - kind of like an internationally-televised version of erectile dysfunction. And speaking of dysfunction, what was that 15 minute Wayne Gretzky ride in the back of a pick-up all about? The talk at the Richmond Skating Oval is all about the "fair" quality of the ice because the facility is at sea-level. And, of course - and sadly - a Georgian slider lost his life in a luge practice run. Boy these Olympics got off to an auspicious start. But observers seem to have looked past these adversities as athletes push swifter, higher, stronger in their quest for gold, silver and bronze. Thank God Canada finally won a gold on home soil. 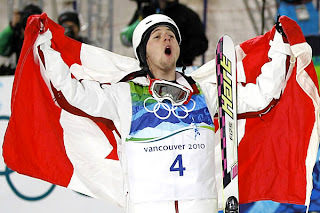 Alex Bilodeau took top honours in the men's moguls event Sunday night. Canadian Olympics broadcaster CTV has really been hyping the crap out of "it's our time" in terms of never winning a gold at a Canadian-hosted Olympics - 76 in Montreal and 88 in Calgary. Maybe now they'll let us recline, enjoy, relax. Vancouver Olympics: Yet another reason not to trust the Canadians. I won't tell you what went through my mind when I read "Flaccider." But (pun intended) you got me at recline. I'm a great believer in recliners. They rawk! Quirks: I know, I read your post today. Essential for L&O marathons, eh? Here some goods news, I now know all the words to O Canada...wanna hear me sing it? Me-Me:Can you do the French part in the middle? ...And people actually want the Olympics in their community or state? When was the last time Olympics host city ever made a profit? Don: I think it was LA. Quebec just finished paying off the Montreal 76 Olympics a year or so ago. The Montreal Olympic Stadium was called the Big O officially and the Big Owe unofficially. Me-Me: Je suis tres impressed! (You see, I'm bilingual.) Now can you sing it? Most Canadians, by the way, forget the lyrics in English! At least the Canadians are out on the streets protesting about the Olympics. We're so downtrodden we can't be bothered to protest about the 2012 summer games. I want another country to hide in that summer. idifficult: And the authorities here, say they have the right to peaceful protest. It's amazing what the Olympics cost...astronomical. Awesome win by Alex. Congrats to all you Canucks! CL: Yeah and we just won another gold in women's snowboard cross this afternoon. WOO-HOO! I was in Vancouver on Valentine's Day. It was 49F (9C) and sunny. The next day, back in Ohio, we got something like 6 inches of snow and the high was below freezing. Vancouver is a couple hours south of Whistler but if all a person knew about Canada was what they saw at the opening ceremonies of the Olympics, they'd think Canadians shared a room in Superman's Ice Fortress. Cdn Blend: Vancouver's had one of the warmest winters on record. The funny thing about the opening ceremony's ice fortress is it was all indoors! I can forgive the Canadians for the luge incident, the erectile dysfunctionality and the slush, which is a little out of their control. But can the Canadians forgive themselves for never winning a gold medal on home turf in hockey? I doubt it very much. The shame! Mike: I was going to say "until now" but last night I watched USA beat us. Uh-oh.